2.3.5. Mix thoroughly by pipetting up and down several times. 2.10.5. 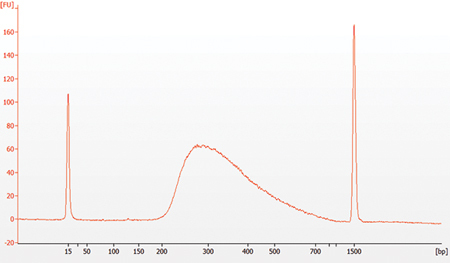 Add 3 μl (red) USER Enzyme to the ligation mixture from Step 2.10.4, resulting in total volume of 96.5 μl. Note: Steps 2.10.5 and 2.10.6 are only required for use with NEBNext Adaptors. USER enzyme can be found in the NEBNext Singleplex (NEB #E7350) or Multiplex (NEB #E7335, #E7500, #E7710, #E7730, #E6609 or #E7600) Oligos for Illumina. 2.11.2. Incubate for 5 minutes at room temperature. Note: If a peak at ~ 80 bp (primers) or 128 bp (adaptor-dimer) is visible in the bioanalyzer traces, bring up the sample volume (from Step 2.13.9) to 50 μl with 0.1X TE buffer and repeat the SPRIselect Bead Cleanup Step (Section 2.13).